Yesterday was Father's Day and, although my father has been gone for many years now, the day brought many memories back. 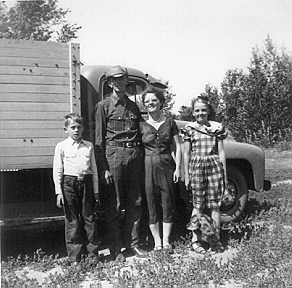 I reminisced (to myself) about my childhood on the Diamond Dot Ranch with my parents and my brother. Those were happy times. These days I am trying to be happy. 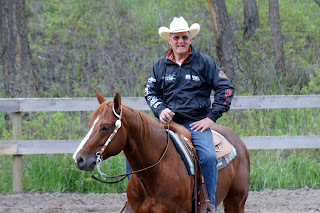 My last two blogs on Reinin', Ridin' and Writin' were not cheerful and this one is going be - even if I have to make a big effort... 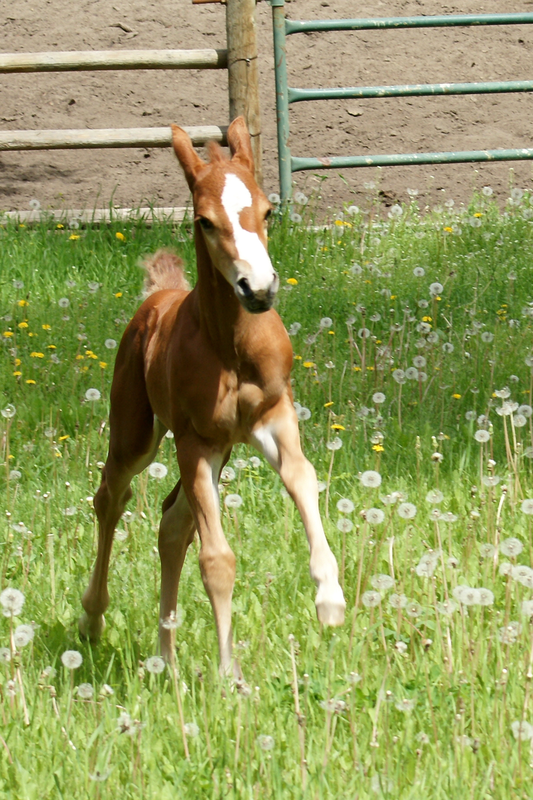 So, since there is nothing on the planet more joyful than young things, especially foals, I chose that as my focus. 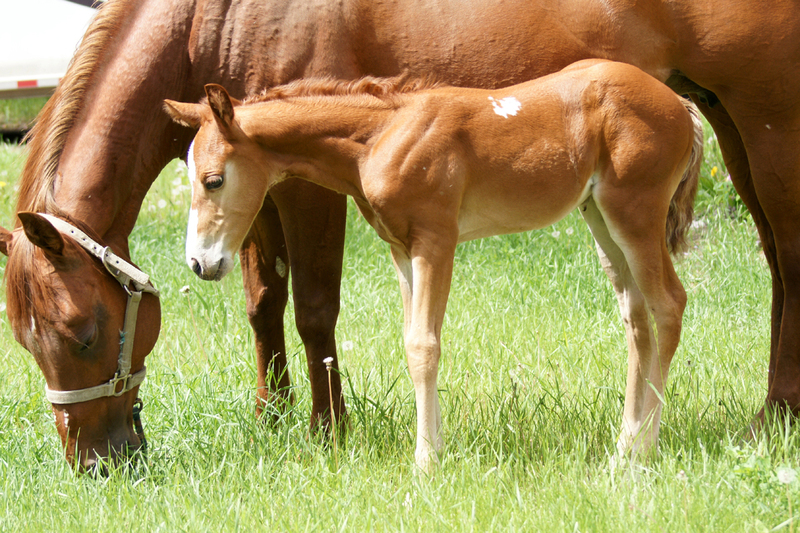 I would spend time with the mares and foals to re-kindle my spirit. 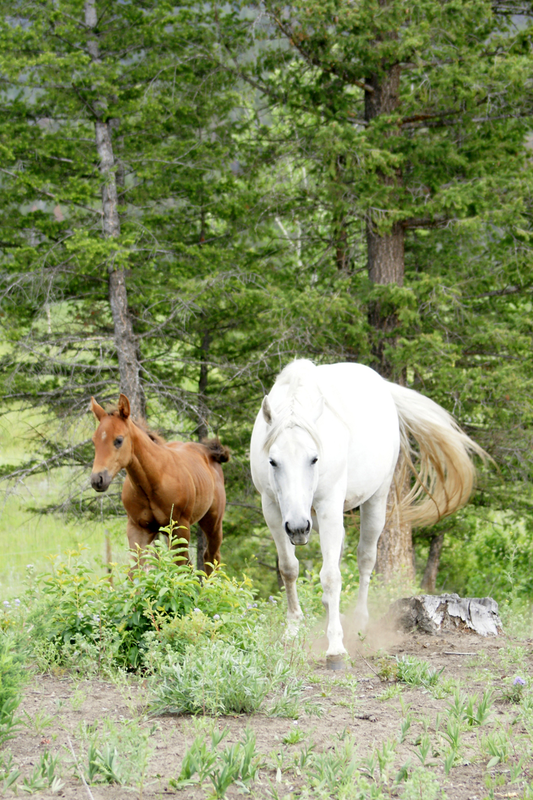 First I walked into the pasture with my camera to find Destiny, Whiskey, Easter and Timber. "The boys" are together now and lovin' it. They are very close in age and will grow up together. These are a few of the photos I took when I hung out with them. 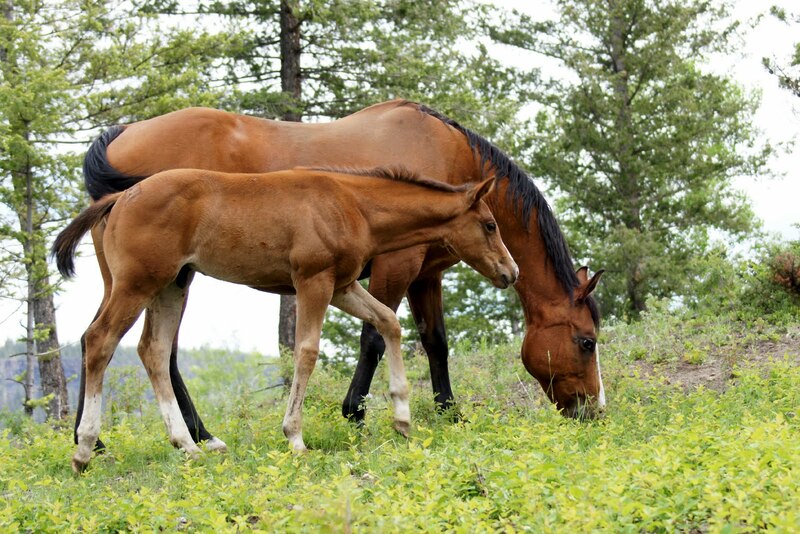 ﻿﻿﻿﻿﻿﻿Wildwood Feather is in a pen with her mother, Silk. At only 11 days old, she is too young and delicate to play with the boys yet but I led Silk to the picnic area under the trees to munch on grass. It was the first time Feather had had so much freedom and, after tentatively testing the distance between her and her mother, she happily explored - the hitching rail (which she ran into! ), the hammock (which fortunately she didn't run into! ), the wheelbarrow of flowers, trees, clumps of grass - always spinning away and dashing in a wild circle around Silk and I. Who could not feel joy watching such carefree fun? Feather running for the pure joy of it! And that was my day - quiet but quietly satisfying - a little healthy nostalgia and a little quality time with my mares and foals. How was yours? Those of you who read this blog every week will notice that I have not posted for the last month. Those of you who know me, will understand why if you read the last blog. I have been walking through it. 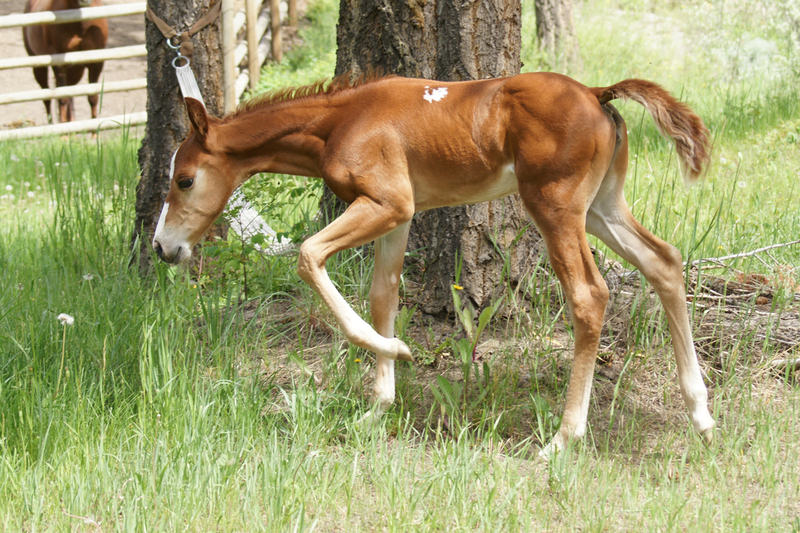 It is exactly a month today since I lost my Wimpys Little Step foal and since that time I have flat-lined. I feed my horses, I ride, eat, sleep - but with no joy. Although I have always seen things in technicolor, now my world is somewhat colorless. Losing first my dog, then the foal that I had pinned dreams to, darkened my world. Writing out my pain in "Beam Me Up, Scotty!" may have been therapeutic but I had a long way to go and still do. There is no shortcut to the other side, no way around, no way to avoid it - I have to walk directly through the pain. Life does go on. I had long ago planned a Vern Sapergia clinic May 27-29. As that time approached, I knew I had to muster energy to do all the things that needed to be done to make that happen. I cleaned the entire house since I had guests, planned meals, even baked the butter tarts that Vern likes so much, but because I had dragged my feet for so long, the grass did not get mowed and the windows did not get done. I rode my young stallion, Walking With Wolves, in the clinic and he was fantastic. Vern rode Running With Wolves and he was fantastic. 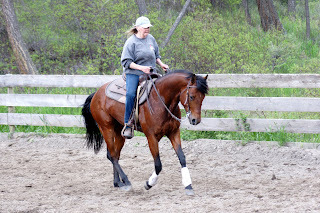 Still I did not feel the surge of joy I usually feel when my horses do well. I was still walking through it. 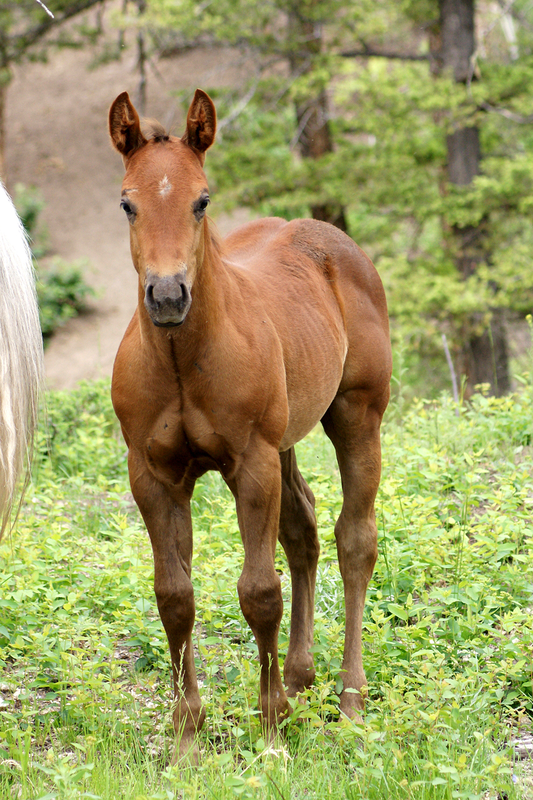 The worst part of it was that I now did not look forward to the birth of my last foal. Silk was due May 20... and I was terrified. Not only did the joy go out of it for me, it was replaced by terror. 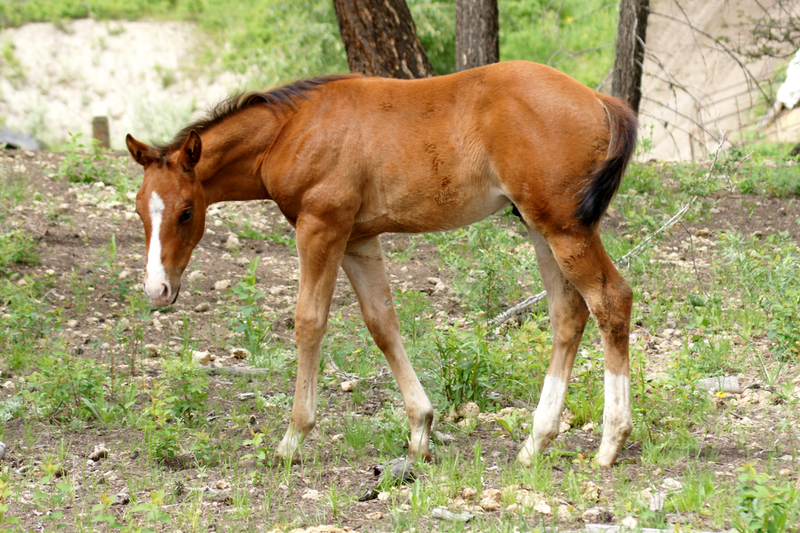 I am not a fearful person and I can't remember the last time I was scared of anything but the thought of another limp, lifeless foal in front of me terrified me. But I knew I would have to face my fears. Silk did not make it easy on me. She was late - very late! On gestation day 362 at 12:20 AM, she finally delivered a sorrel filly. My relief was short-lived. She jumped up, laid down again and started to roll. Colic?? "Perfect!" I thought. "Now I'm going to lose a mare!" 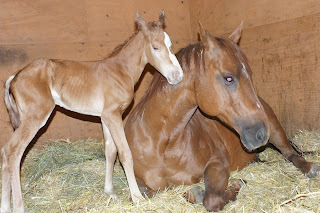 I dragged the newborn out of the stall so she would not get rolled on and went for Banamine and gave her the shot. After a few minutes, when she seemed to calm a little, I brought the filly back in but I could not go back to bed for some time - until I was sure she would not start thrashing around again. 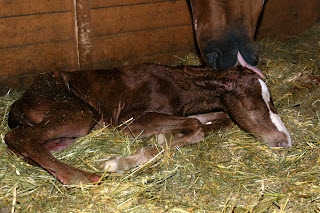 Finally, when she and the baby were laying down, I retired to the tack room... only to be abruptly wakened by a commotion in the foaling stall. Silk was having a full-blown anxiety attack. With a lot of talking from me and the foal sucking she calmed down again. I decided she was upset with the stallion in the barn (or any other horse!) so, at 4:00 AM I moved horses so she could have the barn to herself. Later I wondered if a bear had walked by the barn (if so, I was walking around with the bear!) OR was it the stallion OR had Silk picked up on my fears? At five days old, little Feather is thriving and I am learning to love her and trying to believe she will not be taken. Scotty didn't "beam me up" of course, and he won't. Life is not like that. With my first show of the year only 10 days away, I am trying very hard to believe in all things good again but it's a process. I'm still walking through it.